Remote Box S2 is a durable high end IR remote control unit for Pro-Ject's range of Box Design units or other external electronics via smartphone. Pro-Ject Remote Box S2 is the perfect solution for anyone who needs an universal remote but doesn’t want to have yet another piece of equipment at home that can get lost. 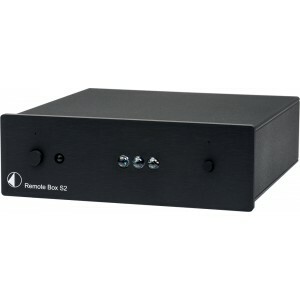 Remote Box S2 is easily controllable with your Android or iOS smartphone. The unique Box Control App is available free of charge and can be connected via Bluetooth to Remote Box S2. Simply pair the devices and control other Box Design products as well as third party electronics, such as TV sets, receivers, DVD/Blueray players etc with the most convenient device there is: your smartphone! All Box Design IR codes are preset for further comfort, so you don’t have to set them up. Simply choose the device you want to control and start emjoying your remote-free life.